Palestinian artists abroad are used to bearing a heavy symbolic load, whether they like it or not. The history of their people, marked by displacement, occupation, and the endless peace process, imparts a certain intensity to even lighthearted work and invites controversies that might have nothing to do with the performers and their material. 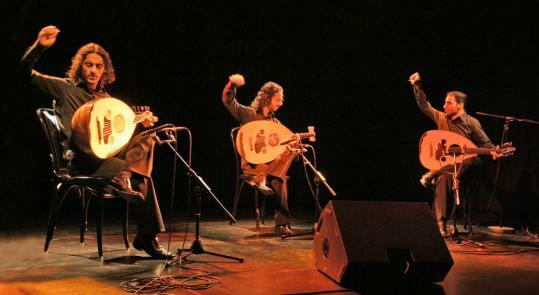 But when the Paris-based Palestinian brothers known as Le Trio Joubran, virtuosos of the oud, the ancient Arabic lute, make their Boston debut at the Somerville Theatre on Thursday, their seriousness will speak to a more intimate loss: the death, in August 2008, of the Palestinian poet Mahmoud Darwish. A leading light of world literature and a national hero who received a state funeral in Ramallah, Darwish was also a mentor to the brothers. Their tribute concert featuring recordings of Darwish reading turned into their third album, “A l’ombre des mots’’ (In the shadow of words), released last year. Passages in the poet’s voice feature on their current dates, too, along with the trio’s innovative instrumental compositions that explore but also depart from traditional Arabic music; the oud is generally an accompanying instrument, and a three-oud lineup such as this, with the addition of percussionist Yousef Hbeisch, is exceedingly rare. By phone from a tour stop in Manchester, England, Samir Joubran, 37, explains that forming a band with his younger brothers Wissam and Adnan — the fourth generation in a family of luthiers — was no grand plan, just an idea that simply came up. “The first time Wissam performed with me I realized we had something new,’’ Samir says. “We didn’t play harmony, and we didn’t play exactly the same melody on the two instruments.’’ Instead, they improvised in conversation with one another and found new ideas and space in the music. Earlier, Samir, who was born and raised in Nazareth and studied at a conservatory in Cairo, had forged a tie with Darwish under memorable circumstances. A gruff figure with the temperament of an Old World intellectual, Darwish disliked reading to accompaniment, Samir explains. But when the two appeared on the same bill at a 1996 performance, organizers suggested they share the stage. Early in Samir’s second interlude, Darwish unexpectedly started to recite, putting the younger man in a dilemma: to continue and risk angering a national icon, or stop? “It was the most difficult decision of my life,’’ Samir says. “I closed my eyes and thought, this is a beautiful chemistry.’’ He played on. After a while he looked up toward the poet. “He just moved his head,’’ Samir says, in approval. Darwish also helped the brothers deal with burdens beyond music. “He taught me there is always pressure from the political issue of Palestine on the culture,’’ Samir says. “We feel it every day, but we don’t know it.’’ He says the poet helped the young men free their music from that insidious stress. The trio’s sound, full of snaky rhythmic figures, drones, and ostinatos, sometimes spare and haunting, sometimes driving and loud, echoes the sense of liberation. Elements of flamenco and even something edging toward rock surface now and again. The three ouds — made by Wissam, who is not just the bearer of the family luthier tradition but a graduate of the Stradivarius violin-making school in Cremona, Italy — share the same size and tuning but have different woods and details, producing distinct colors and tones. “There are lots of secrets inside the oud,’’ Samir says. With 12 years’ gap between eldest and youngest, the brothers have their own differences, Samir says. “Of course we are always fighting, especially when we compose. It’s not easy. Maybe if we weren’t brothers, we wouldn’t stay in the same group.